I would like more information about 533 Lacey Oak Loop. READY FOR MOVE-IN - Entry with 11-foot ceiling leads to main living space. Dining area flows between open island kitchen and spacious family room. Ceramic tile floors throughout. Library with French doors and ceramic tile floor offers view of back yard. Private master suite. Double doors lead to master bath with dual vanities, corner glass-enclosed shower and large walk-in closet. Two secondary bedrooms and a full bath complete this open one-story design. Covered backyard patio. Two-car garage. Directions: From I-35 South: Exit 210 (Yarrington Road). Turn RT on Yarrington Road. Continue to Blanco Vista Boulevard and turn LFT into the community. In 0.7 miles turn LFT on Lacey Oak Loop. 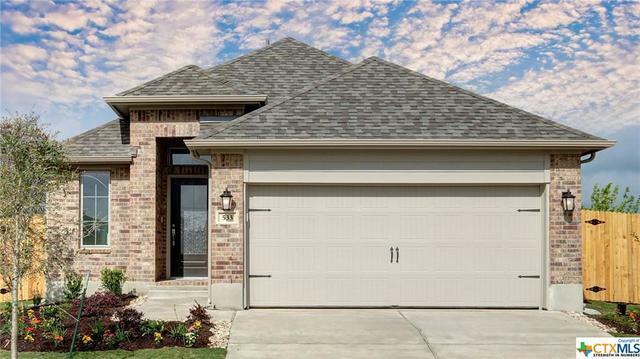 Our Sales Center is at 120 Lacey Oak Loop.